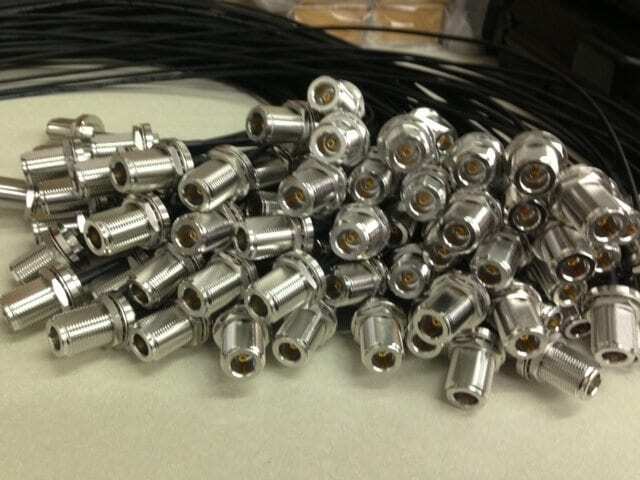 Coaxicom products include a line of 7/16 connectors, designated the Coaxicom 014XXX series, which are used instead of type N in high power, low intermodulation applications. They have a voltage rating of 2700 VRMS, a frequency range of DC to 7.5 GHz, a nominal impedance of 50 W, and are weatherproof. All metal parts in the signal path are silver plated. The Coaxicom 7/16 series connectors are available as crimp and clamp style plugs and jacks for most RG cables, 0.141 and 0.250 semi-rigid, Times LMR cables, Belden 9913, and other similar cables. Bulkhead and panel mount configurations are available, as well as in series adapters, and 7/16 to type N adapters. The Coaxicom 014605 pictured is a crimp type connector for RG58 and LMR200 that can be assembled as a straight or right angle plug, reducing inventory costs and simplifying logistics. This versatility is achieved by utilizing a ferrule stud backnut that screws into the connector body from either the side or the rear. A threaded cap is provided for the unused cable entry point. This unique configuration is also available in clamp type plugs, and as clamp and crimp jacks. For information on the connectors and adapters described or other products from Coaxicom’s broad line of connectors, adapters, terminations, attenuators, phase adjusters, torque wrenches and cable assemblies; contact our Sales Department at 866.Coaxicom (262.9426) or via email to . Cable Assemblies:Right angle adapters using the semi rigid cable approach provide a cost-effective and dependable alternate to radius swept adapters. [Coaxicom.com, Cable Assemblies rev. August, 19, 2016] – Right Angle cable connectors cause significant reduction in the electrical performance of cable assemblies, particularly at higher frequencies. The 3221-1-L series of pre-bent right angle assemblies uses the center conductor of .141 “semi rigid cable as the contact. This fact, combined with an ultra-short SMA plug provides the same or smaller profile as a right angle connector without the performance penalty. User specified lengths to 60” are available. Typical VSWR of these assemblies is 1.10 to 18 GHz, while a similar assembly using a conventional right angle connector is typically 1.30. Right angle adapters using the semi rigid cable approach provide a cost-effective and dependable alternate to radius swept adapters, which have limited availability. An SMA plug to SMA plug swept cable assembly has a typical VSWR of 1.17 at 18GHz. Bent assemblies and adapters using other connectors and cable are also available. For more information on the cable assemblies described or other products from Coaxicom’s broad line of connectors, adapters, terminations, attenuators, phase adjusters, torque wrenches and cable assemblies; contact our Customer Support at 866.Coaxicom (262-9426) or via email to sales@coaxicom.com. Sign up below to receive a FREE Welcome Package and the Coaxicom Connection, the monthly newsletter featuring new product, industry news, and video “how-to’s”. Coaxicom has expanded its product line to include cost-effective, space saving fixed coaxial attenuators which also double as type N to SMA adapters. They operate to 18 GHz, and are available in 1-dB increments to 20 dB. Accuracy is +/-0.3 dB to 6-dB, and +/-0.5 dB to 20-dB. Maximum VSWR is 1.10, 1.20, and 1.30 to 4, 10, and 18 GHz respectively. They are rated for 2 watts average power @ 250 C, and derate linearly to 0.5 watts @ 1250 C. Body and connectors are passivated stainless steel, and conductors are gold plated beryllium copper. The part number is 5910–*– **– (dB), where * is the first connector type (NM for N male, or NF for N female), and ** is the second connector type (SM for SMA male, or SF for SMA female). For example, the part number for a 6-dB attenuator with a type N male and a SMA female is 5910–NM–SF– 6. Overall lengths of the units are 1.32” to 1.53”, depending on the connector configuration selected. For information on the attenuators described or other products from Coaxicom’s broad line of connectors, adapters, terminations, attenuators, phase adjusters, and cable assemblies; contact our Sales Department at 866.Coaxicom (262.9426) or via email to sales@coaxicom.com. With the proliferation of test equipment that use precision 7 mm (APC-7‘) connectors, Coaxial Components Corp. (Coaxicom) has once again expanded its’ line of 7 mm series adapters. Each adapter uses a 7 mm connector on one side, and either a type N, TNC, SMA, SSMA, 3.5 mm, or BNC on the other. The coupling mechanism is stainless steel to ensure ruggedness and repeatability. 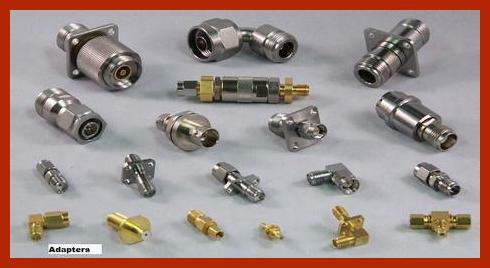 All Coaxicom 7 mm adapters with the exception of the BNC series are specified to 18 GHz, and have excellent VSWR. The type N versions (3712-9 male, 3713-9 female) feature a maximum VSWR of 1.05:1, while the TNC series (3710-9 male, 3711-9 female) have a 1.12:1 maximum VSWR. The SMA (3909-9 male, 3908-9 female) and the 3.5 mm (3.5909-9 male, 3.5908-9 female) maintain a VSWR of 1.07:1. SSMA adapters (7902-9 male, 7901-9 female) have a VSWR of 1.10:1 maximum. The BNC adapters (2702-9 male, 2701-9 female) have a maximum VSWR of 1.04:1 at 4 GHz, but due to their precision construction are useable to at least 6 GHz. For information on the adapters described or other products from Coaxicom’s broad line of connectors, adapters, terminations, attenuators, phase adjusters, and cable assemblies; contact our Sales Department at 866.COAXICOM (262.9426) or via email to sales@coaxicom.com. Coaxicom designs and manufactures an extensive line of standard, as well as custom microwave and RF connectors all available in 50 or 75 Ohm impedance. We have proudly served Customers in industries including the US military, automotive, medical, instrumentation, aerospace, defense, telecom, wireless alternative energy and more. Coaxicom is committed to providing outstanding service, value and quality with our made in the USA RF Connectors since 1984.